Uh, yeah, that's not actually what my freezer looks like. But I can dream. Something happens to me this time of year. I start nesting. No, I'm not pregnant, but it does feel similar. Now that at least the nights are cooler, I am compelled to cook mass quantities of comfort food and stockpile them in the freezer. Not that we're in danger of being snowed in any time soon. Case in point: we had a high of mid-nineties today. Still, nature is telling me it's time to prepare for winter... that and I'm just tired of cooking dinner every night. And now we're eating out for the rest of the week. Just kidding. In case you think I spent two days cooking, let me reassure you that it's easy to to cook this amount of meals in the same time it takes to make dinner each night. Well, maybe not easy, but it is doable. I started by browning three pounds of ground beef/turkey mix and adding taco seasoning Monday night. Then I used the taco mix to make the taco bake, which we ate for dinner. Tuesday, we had taco salad for dinner and I made the yeast dough for the beef braids and put it in the fridge for the next day. Wednesday, I used the rest of the taco beef for the beef braids and froze a quart of the leftovers for tacos another week. I also mixed the remaining ground beef/turkey in a bowl with an egg, some parmesan cheese, salt, pepper and Italian seasonings and shaped it into meatballs and meatloaf. Thursday, I tackled the chicken. I used a knife to cut one large breast and one chicken "fingerling" away from the bone. I poached a third of the chicken breasts and put the rest in marinade. We ate two of the marinated chicken breasts for dinner and some of the poached chicken for the kids. Tonight, I'll bread and bake the chicken fingers, and we'll eat some and freeze the rest. A few tips on freezing food. I try to cook and cool everything first. That way, you can just take it out of the freezer the night before and cook it up or serve it room temperature (like the grilled chicken breasts). Just don't overcook or grill your meat so it's not too dry after being frozen and reheated. Individual items like meatballs are great frozen on a tray and then placed in a freezer bag so they don't stick together. I also try to cook small amounts of a lot of different kinds of food. Even family favorites like lasagna get dull when you have them every week. For something like a beef braid, wrap in foil first, label, then seal in a freezer bag. 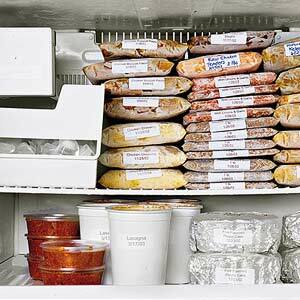 Defrost your meals in the fridge over a day or two or bake them frozen. Recipes for the beef and ham and cheddar asparagus braid will follow. Other freezer items I typically tackle this time of year are big batches of my MIL's awesome marinara recipe, lasagna, gnocchi and pumpkin muffins. Stay tuned! Sometimes dinner is more of a come-and-go event than a sit down occasion. Take last Monday night at our house for example. We normally eat early, around 5 p.m., but I had a vet appointment at 5 p.m. and my MIL came to watch the kids. Rich didn't get home for dinner until late. So I needed something that everyone could customize to their tastes and that would hold up over a couple of hours and still taste good. And I needed a lot of it, since a good friend stopped by at the same time with her boys, who wanted some too (veggies always look better at other people's houses). This chopped salad met all of the above requirements and then some. I served it with a pan of hot rolls and had leftovers for lunch the next day. It was a great way to stretch four chicken breasts to feed a crowd. The idea and Greek dressing recipe are modified from the Spring 2008 special publication by Fine Cooking magazine called Fresh. If you're actually all sitting down to eat at the same time and everyone likes the dressing, you can toss each item in some dressing and arrange in neat, separated piles on top of a bed of lettuce. Beautiful. Of course, leftovers will be soggy so eat up. Also, the anchovies in the dressing are awesome. They provide a little umami for your tongue without the fishiness. If you're worried the anchovy will be too strong, start with one or two fillets and freeze the rest for later. And try to keep all of the pieces of veggies about the same size--1/2" cubes--with the exception of the chicken. 1.) Combine the dressing ingredients in a bowl (I used a measuring cup since I could pour the dressing from it and didn't need anything fancy). Mash the anchovies well and whisk it all together. Let sit to blend flavors while you assemble the salad. 2.) Heat 1 Tb olive oil in a pan and season the chicken breasts, both sides, with salt and pepper. Fry until brown and cooked through. Let cool and slice into strips. 3.) Chop the veggies and cheese in consistent 1/2" pieces. Put each item in its own bowl. Serve. Recently, I ran out of room on my cookbook shelf. I decided to comb through all of the magazines I've been saving for the past 15 years, pull out any recipes I actually wanted to make, and discard the rest. I couldn't believe all the room I had on my shelf when I was done! Life has changed big time since having kids, and many recipes I had saved no longer fit my lifestyle. As I trashed magazine after magazine, I recalled my grand plans for serving magnificent meals to friends and family. Then, entertaining was an event that involved an entire day of cleaning, cooking and planning, not to mention a week of menu planni ng and shopping. These days I'm lucky to find time to swish the brush around the commode and load the dishwasher before the doorbell rings. And if you're a really good friend, and I feel very comfortable with you (a.k.a. I've seen your dirty laundry too) I won't even bother with that. Because I know you'll love me anyway. When I finished sorting, I only had five recipes in my hand--most of them involving chocolate. This recipe for a crostata was first on my list to try. The recipe came from a fantastic article from the November-December 2007 issue of Italian Cooking & Living -- a magazine that I believe has since gone to glossy heaven. The recipe is easy enough to bake on a weeknight and the finished product is pretty enough to serve to company. The IC&L article gives step-by-step illustrated instructions on how to make a crostata, a history of crostatas and a half dozen variations on the dessert, as well as instructions on how to make the dough by hand, in a food processor or a stand mixer. The Type A in me groans in ecstasy at their thoroughness. The creative side of me decides to ignore their exact instructions and change it up just a little. The blogger in me thinks that I may be posting two other versions of this in the future--one with raspberry jam and one with peaches, apples or pears. For now, however, here are the instructions and photos (inspired by IC&L's article) for making Chocolate Hazelnut Crostata. Lincoln helped me roll out the dough and make snakes for the crust, both things he's used to doing with play dough. And everyone helped eat it. Nutella is on sale at Harris Teeter right now. A sidenote: As much as I enjoy the taste of Nutella, those commercials about spreading it on whole grain toast for yor kids to eat a healthy breakfast just tick me off. Let's call sugar, sugar and not try to pass it off as health food. This crostata does not count toward your nutritious breakfast. :-) Just enjoy it and share with a friend. 1.) I used a food processor to pulse all of the above ingredients until a ball formed. You can also do the dough by hand, kneading it a few seconds to pull it together, or use a hand or stand mixer. 2.) Transfer dough to a sheet of plastic wrap, rolling it into a ball and then pressing down to make a flat disk. Refrigerate 30+ minutes. 3.) Working quickly, transfer the dough to a floured sheet of parchment paper and roll into a 1/4 inch thick circle with a floured rolling pin. 4.) Using a medium-sized pan lid, cut out an even circle. Gather up the extra dough and put it in the freezer to stay cool while you do step 5. This dough gets sticky if it doesn't stay cold. 5.) Spread a large dollop of Nutella over the base. Set aside. 6.) Roll out leftover dough on a separate piece of floured parchment and use a pizza cutter or knife to square off the dough. Cut 8-10 long strips for the lattice top. Gather up leftover dough and put in the freezer while you do step 7. 7.) Place half of the strips across the dough one way. Crisscross the other strips on top to form the lattice. Trim the excess off the edges with your pizza cutter. 8.) Gather up any leftover dough and roll into snakes on a floured surface. Lay the snakes along the edge of the crostata forming a crust. Press gently with your fingers to seal to the layers of dough underneath. 9.) Beat the egg white and gently brush onto the lattice work and crust. 10.) Top with toasted hazelnuts. 11.) Bake on the parchment paper on a pan or baking stone in the oven at 375' for 35 minutes. 12.) Serve hot with a small scoop of vanilla ice cream or cooled by itself. Serves 6. Chocolate. What can I say that hasn't already been said? I gladly embrace life with a few extra pounds just to have my daily dose of it. And when it's the good stuff, like the handmade chocolates by Escazu Artisan Chocolates, a little goes a long way. Rich and I have been a fan of Escazu since they had a small shop in Glenwood South but then they moved somewhere on the north side of the city. We spent one night driving in the dark into some interesting neighborhoods looking for them and finally gave up. Luckily, I was on their e-mail list and when they reopened on N. Blount Street, we skedaddled over to get our fix. The new shop is a little roomier but with the same Ikea furniture. They've added a glass window with a view behind the scenes into the chocolate-making process. And now they're also offering tours. Escazu tours are available on the first Friday and Saturday of every month. They're free but you'll need to make a reservation. The cozy shop can only accommodate a limited number of visitors, so spots book up fast. I made my reservation a month in advance because we missed out on the first set of tours in August. My friend Sandi and I had a light dinner at Market Restaurant next door, and then joined in on the tour in progress. The tour lasted about 30 minutes and we were able to see the chocolate in all it's different stages. Escazu actually buys their beans from small farmers in Central/South America, hand sorts them, roasts them in a giant metal ball at a low temperature, tempers them and crafts them into bars and individual filled creations. They even hand wrap their bars. We tasted the chocolate at three different stages, including the cocoa nibs, then queued up for hot cocoa and chocolates to end the tour. The spicy hot cocoa was divine. We also sampled four or five chocolates, which they cut in half for us to share. The chocolates are around $2 a piece, which adds up quickly. But really, any more of these chocolates in one sitting is asking for insomnia. It's like drinking an espresso before bedtime. My favorite flavors from last night include the caramel (top right), goat's milk ganache (bottom center) and dark chocolate basil (sorry, that one disappeared before I could get a photo). Sandi also really liked the white chocolate raspberry (left), although we couldn't find any hint of white chocolate in it. I think it was mislabeled. I've tasted their bars in the past and really prefer these tiny, potent creations. I'm hoping in the future they'll also add a chocolate tasting (for a fee of course), kind of like a wine tasting but with flights of single-source chocolates so you can taste the differences. I think I would need a designated driver. A word if you're planning a girl's night to Escazu or Market Restaurant: parking in front is limited to five or six spots but there's plenty of parking on the street, and it's well lit. I'm not familiar with the neighborhood, so don't know how safe it is. We came out after dark and there were two groups of men hanging out across the street and behind the restaurant near some rundown looking apartments. Both areas were poorly lit. It was late and we were glad we'd parked under a streetlight close to the restaurant. Overall, I wouldn't let it deter you from a visit. Just be aware of your surroundings if you'll be coming out of the building after dark. Also, it was a beautiful night to sit out on the patio at Market Restaurant and enjoy a pitcher of sangria and some ceviche and crab cakes. The food was light and fresh, a good prequel to Escazu. If I lived in the upscale townhouses across the street I'd be there a few nights a week, although I wouldn't drive across town for it. Of course, they're one of the few places I've seen goat on the menu locally, even if they were out of it last night. I'm sure we'll be back. If you're adding fresh veggies, saute them first in a little oil. This will draw out any excess moisture and make sure you have tender-crisp and not undercooked, crunchy veggies. Then scramble the eggs in a separate bowl with the milk and pour it over top of the veggies in the hot pan, mixing in any cheese you want to add. Cooking a fritata: You can cook a fritata two different ways, depending on what kind of pan you want to use. Nonstick pan-- cook on medium, scraping the sides toward the center gently with a plastic spatula. When the egg is fairly set (8-10 minutes) jiggle it until you're sure it's loose from the bottom of the pan. When you're ready, flip the fritata out onto a large plate, so it's raw side down, then slide it back into the pan to finish cooking, another 5-8 minutes. It's ready when you poke a hole in the middle and you don't see runny egg oozing out (make sure you're not looking at melted cheese). I saw this method on Rachel Ray's cooking show and gave it a try for the first time. The presentation is nice and you don't have to heat the oven. Cast iron or Iron-clad--Any kind of pan that's oven proof is great too. You won't get that lovely fritata to slide out on a plate but it will still look great. And hey, one less dish to do. Cook the fritata the 8-10 minutes while you preheat the oven to 400'. When it's fairly well set (read: not too jiggly or watery looking), pop onto a rack set high near the broiler in the oven. Bake until it's puffy and golden brown on top. If you have kids (like my preschooler) who won't eat everything all mixed together, you can also easily set aside the basic ingredients--scrambled eggs, meat, raw or sauteed veggies--and still have a complete meal. Add a fruit or green salad and you're all set. Luckily, we don't all have to eat like preschoolers. :-) Rich, the baby, and I ate it as is. I was thinking next time it would be good with crusty bread and some fresh tomato bruschetta too. Top it off with a little shaved parm to make it extra fancy.